Before we get into specifics, a little background. 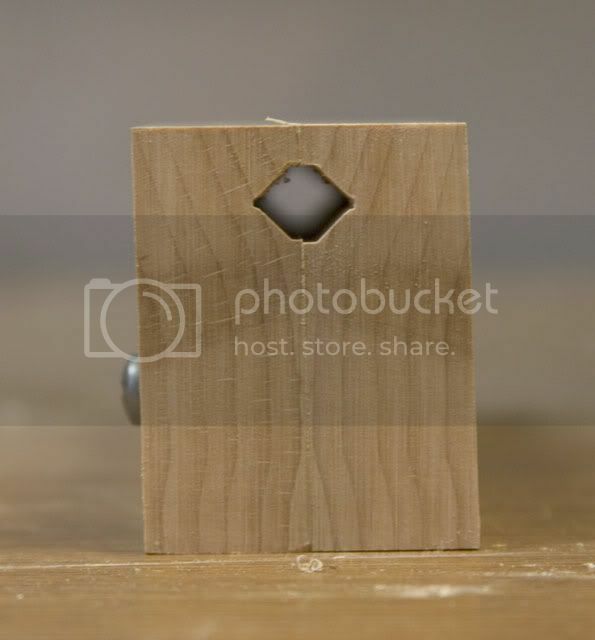 This was a jig I designed, built, and posted to the Stickbow.com site in August, 2000. 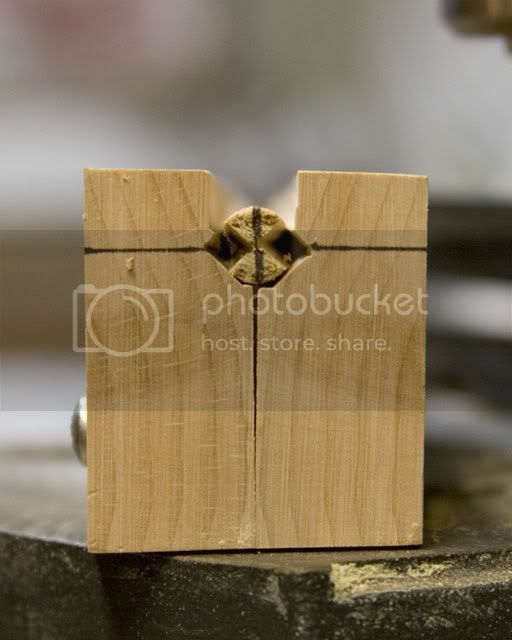 Shortly thereafter, I posted a how-to online on making this jig, but the hosting site recently ceased services. As a result, I am doing a new build-along for TradGang.com. Please feel free to contact me with any questions that you may have. Instead of simply posting photos of my original jig, I figured that a true build-along would be better. 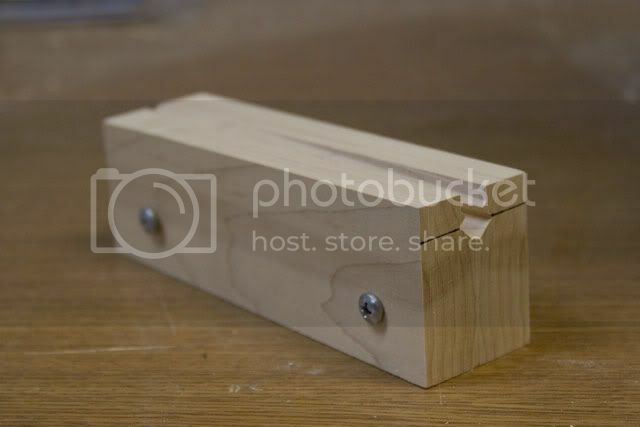 That way, you can see step by step how to make one of these jigs. 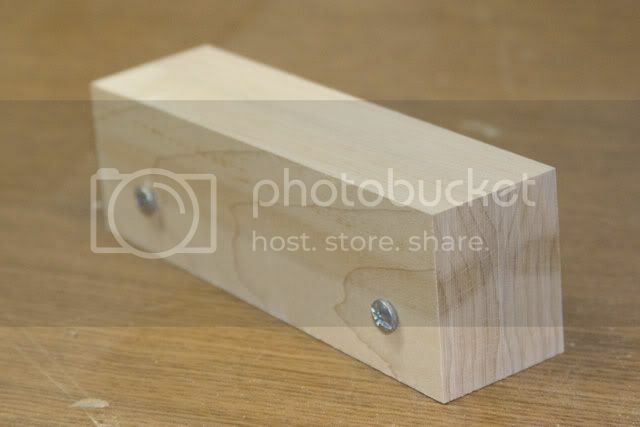 The only materials you will need are some scrap ¾” thick hardwood (oak or maple are fine) and two screws (1 ¼” long is perfect). Tools will be discussed as we go along. The first step is to layout the dimensions of the jig. You want to make both sides 6” long, 2” tall on the front, and 1 13/16” on the back. 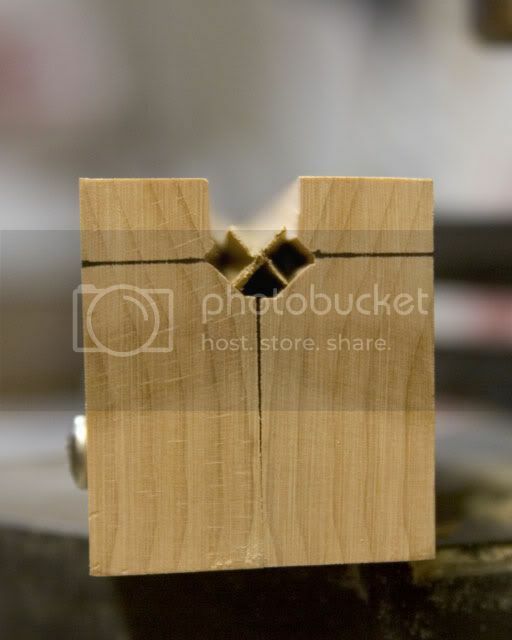 Cut out both pieces, clamp them together and drill two holes through them. The holes should be smaller in diameter than the threads of your screws. Unclamp the pieces and enlarge the holes in one of the two pieces slightly larger than the threads of your screws. This allows you to use the screws to “clamp” the arrow shaft within your jig—loosen the screws to remove, replace, or rotate your shaft; tighten them to clamp the shaft in place. Once that’s done, you may wish to screw the jig together and clean it up on a belt sander to get the top, bottom, front, and back evened up. 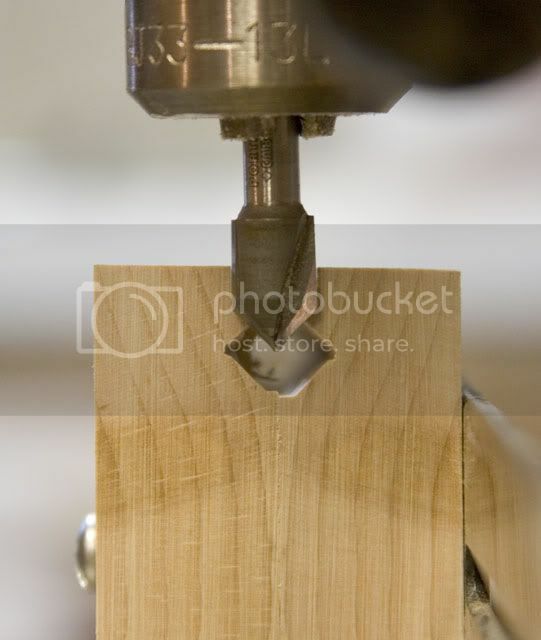 For the next step you will need a drill press with a fence and a 3/8” 90-degree V bit (common router bit). You will ultimately need these tools to make your footed shafts anyway. Set your fence so that it is 3/8” from the center of your V bit. 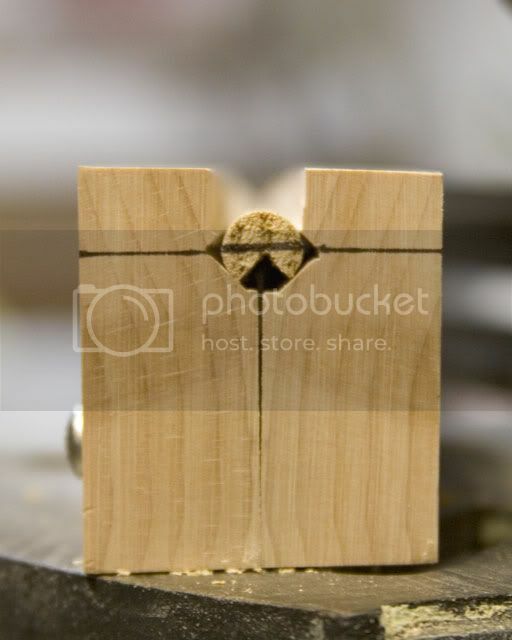 Set the depth so that it cuts into the jig as shown. Now mill a grove down the inside of both halves of your jig, one at a time, with the top of the jig against the fence. Now for the second step, adjust your fence and bit depth as shown. This is the front (tall side) of the jig. 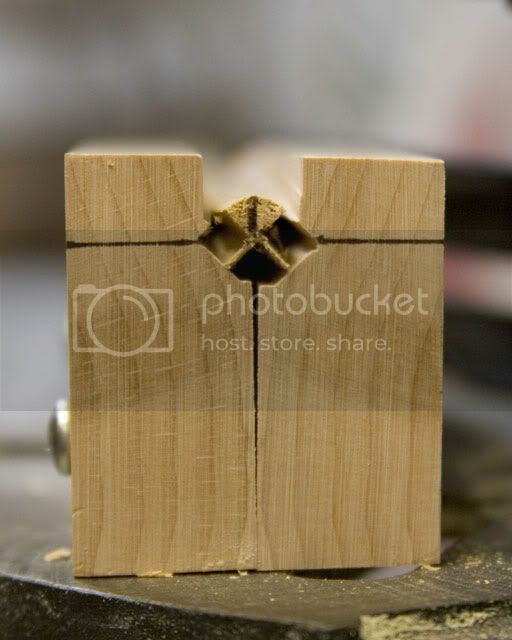 You want the bottom of the V bit a little deeper than halfway down the grooves you milled during the first step. Make one pass, front to back. Draw a guideline horizontally across the front and this is what you have…your finished jig! As it sits, it should yield wings of around 4 ½” in length. You can adjust the length of your wings by “tuning” the jig on a belt sander. For longer wings, sand the bottom to reduce the angle of the jig (reduce the front height). To decrease the wing length, sand the bottom to increase the angle of the jig (reduce the rear height). Before you chuck up a good arrow shaft, take a piece of scrap and test it first. It may take a lot of fine adjustments to your fence and bit depth to get the perfect grooves in your shaft. Draw a guideline across the center of the end of your shaft. Align it with the guideline on your jig and make your first pass…as always, front to back. Rotate your shaft 180 degrees, aligning the guidelines, and make your second pass. Rotate your shaft 90 degrees, aligning your guideline with the center of the jig, and make your third pass. Rotate your shaft 180 degrees and make your forth and final pass. Here is your finished shaft. Now you’re ready to glue up your footing and reduce it to size. Have fun and enjoy. Dang that is great! Have always wanted to try...might have to try. I always wondered how this is done. Ohh, one question. 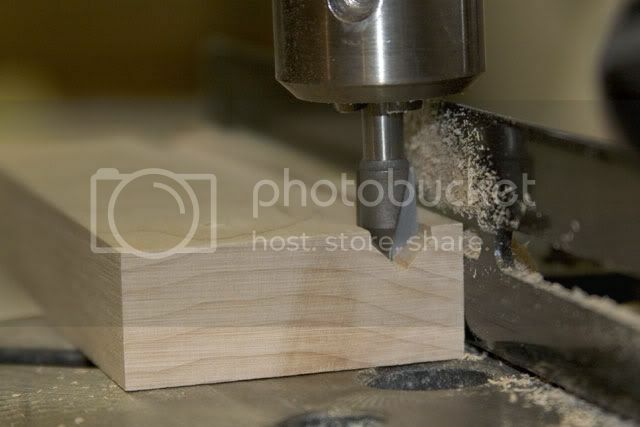 What is the speed of your drill press to get a clean cut? Nice looking shaft. will have to get a bit and try it myself. I set mine on medium speed, which is 1720 rpm on my drill press. Nice work. What did I miss? How do you make the footing? 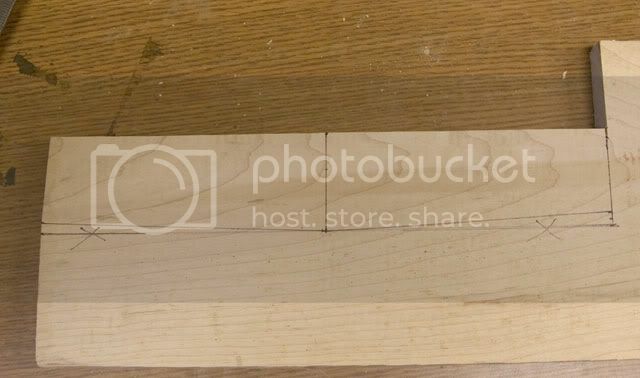 The footing is a long 3/8" square piece with two center cuts down the length that form a plus sign. You make the cuts slightly longer than the length of the V grooves in your shaft. The remaining, uncut section of footing becomes the end of your arrow shaft. 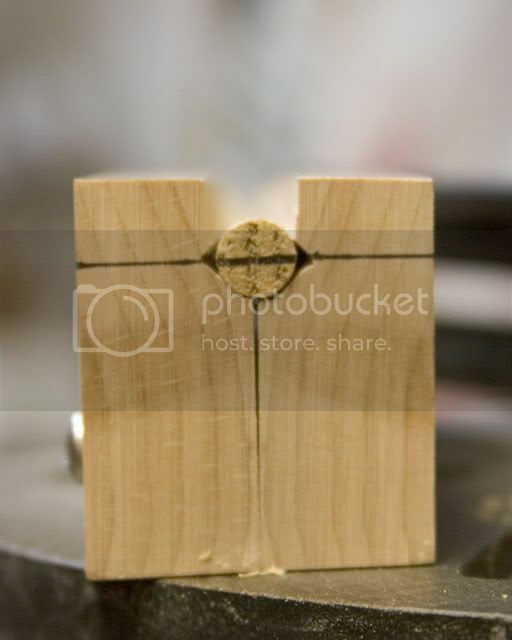 Put a pair of clamps on the footing just below the cuts to keep it from splitting. Glue it onto your shaft, and once it's dry, reduce to size. 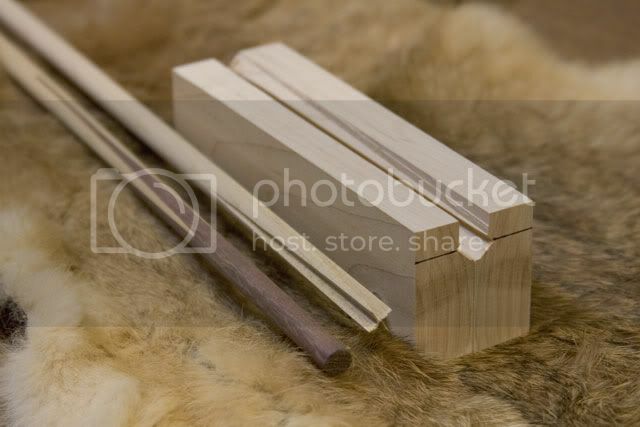 Jason, can you post a photo of the second piece of wood that you are going to glue to the arrow. That looks easy. I didn't think it was going to be that simple. Thank you very much. Are there any tricks to reducing to size? Thanks for the build along i was going to buy one of these from 3 rivers this summer to play around with but i think now i will just build this one instead.